If you’re a regular reader of this blog, you know Hubby and I have attended two previous Dishcrawls. Unfortunately, they both fell during a time period where we were super lax in writing. Tracy, the Tampa Bay Dishcrawl ambassador, graciously invited Hubby and me to attend the Dishcrawl at International Plaza as her guests so that we might blog about it. Free food? Yes, please! Dishcrawl started at Pelagia Trattoria at 6:45. Upon arrival we noticed the beautiful long table set up on the patio. The Pelagia patio is in the shade and there was a nice breeze this particular evening. Shortly after we sat down the servers brought plates of meat and cheese with duck prosciutto, prosciutto di parma, chorizo de bilbao, manchego-piquant cheese, another cheese (not sure what), almonds, olives, and honeycomb. Beautiful presentation and very tasty! After all the meat and cheese was gone, the servers brought plates with three bowls: one with cavatelli, porcini mushrooms, and veal in a black truffle cream sauce; one with a salad of watercress, grilled pear, maple bacon, blue cheese, and cilantro pesto; and, another bowl with squid ink linguini, blue crab, and a seared scallop. 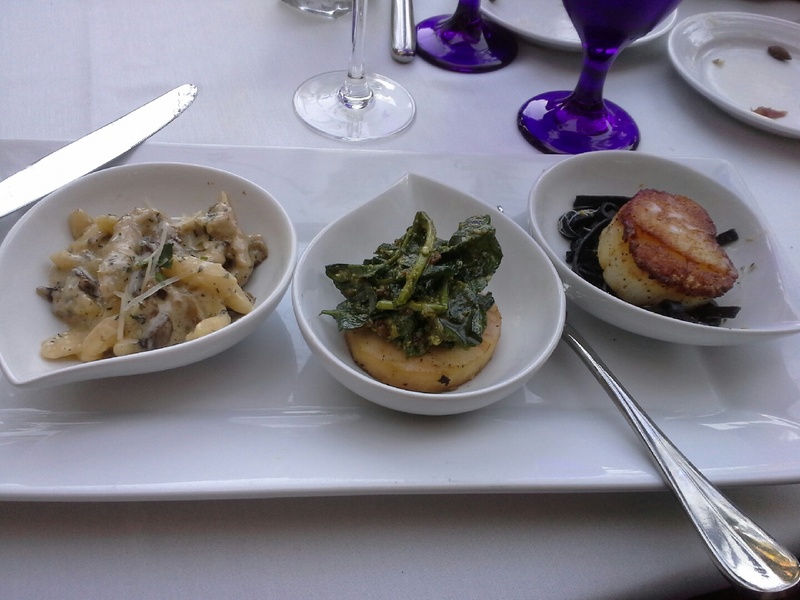 All three dishes were absolutely superb. The cavatelli was creamy with a perfect hint of truffle and the veal was awesome (I don’t usually eat veal but I made an exception for, ya know, research). The salad was tangy, balanced well by the sweet pear. The linguini was also exceptional and the scallop on top was perfectly cooked – very creamy inside with a nice sear on the outside. After Pelagia we went over to Capital Grille. The sales manager, Corinne, was waiting outside and gave us a very warm welcome when she spotted our Dishcrawl nametags. She showed us into a private room where shots of Stoli Doli, their house-made pineapple infused vodka, were waiting for us. After everyone had arrived servers brought out trays of individual cups of lobster mac and cheese and miniature tenderloin sandwiches with mushrooms and Boursin cheese. The lobster mac and cheese was delicious: creamy, cheesy, and piping hot. But the best part was the huge chunks of lobster in each cup. The sandwiches were equally good. The steak was tender and the toppings were a fantastic complement. After Capital Grille, we went to Too Jay’s – which kind of surprised me at first. I used to eat there quite a bit and never thought of it as anything special. The staff was very gracious when we came in and showed us to a section of booths in the back reserved for us. A few minutes later the servers started to bring out plates: sandwich halves with piles of corned beef on them the size of baseballs, cheese blintzes, and latkes. I’m not a corned beef fan so at first I was a little disappointed but I’m a good sport. That was THE BEST corned beef EVER. I devoured my sandwich. The cheese blintz, which came with some cherry compote, was creamy, crispy, and had the perfect touch of sweetness. The latke, accompanied by sour cream and applesauce, was crispy and salty with just a hint of herbs. I ate all of my plate, plus the blintz off of Larry’s first plate (he’ll explain). Our final stop was Le Macaron outside of Nordstrom. Le Macaron is a small Florida chain. When we arrived they had cups of gelato waiting for us; we got to choose between chocolate and Bulgarian yogurt with apricot swirl. Hubby and I both had the Bulgarian yogurt. Then we got to select two macarons out of the case. I had pistachio and rose. We also got shots of Kahwa cappuccino. The gelato was absolutely out of this world. Tangy like Greek yogurt. Next time I’m at the mall I’ve gotta stop in for some. The macarons were very tasty. I prefer mine less chewy but the flavor was fantastic. The little cappuccino shots really hit the spot. After we ate dessert we went back to Pelagia to get our parking ticket validated (we used the valet at the hotel) and started talking to one of the managers and our fantastic server, Cindy (she waited on us back in December). We decided to stay for one more drink. The manager made us cocktails using their house-infused grappa. My drink, the Equinox, had grappa infused with Port wine grapes. Hubby had the Pelagia Blue (the new one – apparently there was a cocktail there sometime back with the same name), which was blueberry infused grappa, blue curacao, and lemon juice. Hubby and I both thought making cocktails with grappa would be a good way to introduce more people to the spirit and would make a good foundation for a cocktail menu, which Pelagia currently lacks. I know some people might turn up their noses at eating at the mall. I admit I was a little skeptical about this experience, even though I’ve eaten at Pelagia, Too Jay’s, and Le Macaron before (as well as just about every other restaurant there). But we really had an absolute blast. Pelagia absolutely knocked it out of the park. 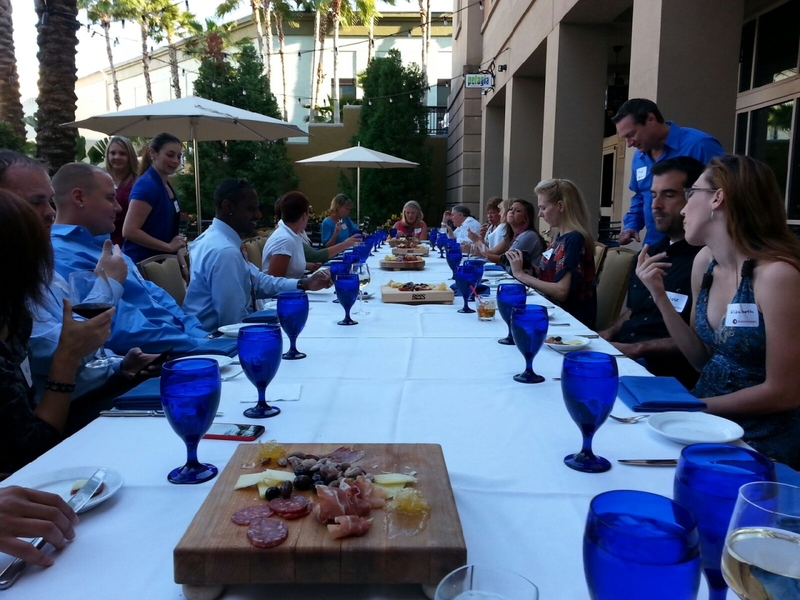 Dishcrawls are a fun way to try new things and meet new people at a very good price. We highly recommend trying these events. So I was pretty excited for this one, we had been to two Dishcrawls before and they were a lot of fun! Since the wife covered the set-up of this I’ll get right into it. The first place we went was Pelagia Trattoria. Lots of fun. Been to the restaurant before and thought it was good, but nothing fantastic. This visit changed my mind. Started at a huge table that was nicely set with a bunch of platters of cheese and charcuterie. All of which was delicious! They snuck something in on me which I didn’t think I would ever eat, which was duck prosciutto, and it was really good, though I don’t think I would ever buy duck, because it’s a cute duck. The platters had honey comb, black and green olives, and almonds, which are always great accompaniments for these platters. We were then served a plate with three courses on it. A grilled pear, blue cheese, and bacon salad that was insanely good. I would seriously have to say one of the best salads I’ve ever had and I don’t like vegetables. The second dish was cavatelli pasta with porcini mushrooms and a black truffle cream sauce. No veal in mine. This was great. It had a nice hint of truffle without being overpowering like it is in most pastas. Mushrooms were done perfectly and it was not too heavy. The third bowl was a squid in pasta with crab meat mixed in and a seared scallop on top. Again, really, really good. The scallop was done well, the pasta was a nice al dente, and there was a nice amount of crab in it. From there we went to Capital Grille, which I ate at about 10 years ago and have not been back to since. Started with a lobster mac ‘n cheese, which was super creamy and rich. The pasta was a twisted noodle, which had a good consistency. Each individual cup was served with a whole lobster claw resting on top. This was awesome, second best mac ‘n cheese in Tampa (best is at Bern’s, third best is at Ocean Prime). Others had beef sliders and I had a lobster and crab cake slider. It was really good, nice brioche bun that was buttered and grilled and the crab cake was mostly meat and not a lot of filler, which is always nice to see. The food here was great and I would definitely try Capital Grille for dinner! We then went to Too Jay’s where they had a nice little plate come out (at first they brought me a plate with a corned beef sandwich, which I didn’t touch, so Wifey ate my blintz). For me, a vegetable wrap with a balsamic dressing, a cheese blintz and a potato latke, served with three great sauces! The wrap was fresh and crisp, not too much sauce. The cheese blintz was awesome, sweet and salty. The latke was fried crisp and delicious! The last place we went, for dessert, was Le Macaron. I had a salted caramel and a vanilla bean macaron and an apricot Bulgarian yogurt gelato. They were excellent macaroons, tasted better than I expected, sweet and salty, crisp with just the right amount of filling. The gelato was out of this world, the best flavor of gelato I have ever had! I’d go to the mall just for this! Overall it was awesome. I loved everything served, was stuffed to the gills when we left, and had a great time with the wife, as always. Tracy, the gal in charge, was awesome as usual and was very attentive and sweet. Able to answer questions even when she was super busy, and she was a lot of fun. The Dishcrawl experience is always fun and exciting, worth every penny and then some. The restaurants and dishes are always a surprise, which adds to the experience! If you have an evening off, DO IT! *The Foodies were given free tickets to the event in exchange for agreeing to write about the experience. This entry was posted in dessert, Dishcrawl, great value, restaurant review, Tampa, unique. Bookmark the permalink.